Though Dr. Mavrostomos’s practice is located in Bedminster, he has many patients who drive from Bridgewater and Morristown because they are looking for a quality cosmetic dentist, and feel he is worth the drive. About half of all Americans wish they could change something about their smile according to an American Dental Association survey. With porcelain veneers you can do just that. Chips, gaps, discoloration, and misshapen teeth can all be remade. Porcelain veneers are thin wafers of porcelain that are bonded directly to your teeth using a special procedure that requires post-graduate training to learn. First, you and Dr. Mavrostomos will sit down and talk about what type of smile you want. There are many ways to get specific smiles. For instance, subtle changes make the difference between giving someone a youthful smile or a sophisticated smile. Dr. Mavrostomos knows those subtleties, so once he knows what you want he can get started right away. He’ll begin by making a diagnostic wax-up and designing a set of temporary veneers for you to wear while he sends your order to the lab. 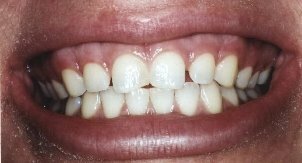 This will give you an idea of what your permanent veneers will look like. In a short time, usually just a couple of weeks, your veneers will be done, and we’ll set your second appointment for you to try on and place your porcelain veneers. We’re so confident you’ll love your new smile that we have a beautiful smile guarantee. You may click here to learn more about it. 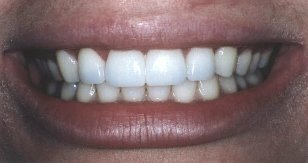 Here is just one example of what porcelain veneers can do for your smile. 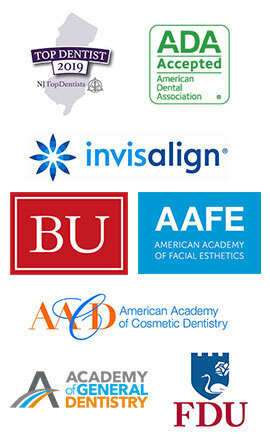 To learn more about porcelain veneers, visit our main veneers page here. If you are ready to get started on your beautiful smile you may call our office at (908) 234-1401 to set your appointment. You may also request a complimentary consultation where you can sit down with Dr. Mavrostomos for about 10-15 minutes to review your case and ask him any questions. This way you can decide if porcelain veneers are for you without having to pay for a full appointment.